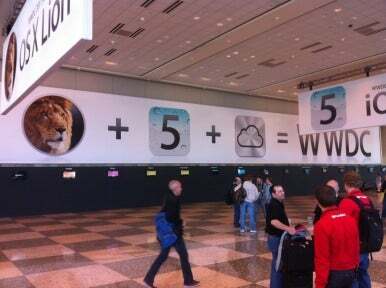 At first glance, there was nothing surprising about the banners: Lion plus iOS 5 plus iCloud. Three topics featured during the company’s keynote last week, and the same three highlighted in Apple’s press release announcing the WWDC keynote. But the interesting part isn’t what was on the banner; it’s how. As Apple’s major platforms, it’s to be expected that iOS and Lion would be the focus of the company’s developer conference. iCloud, though, was something brand new—and yet it got equal footing with two of Apple’s flagship products. That’s because, going forward, iCloud is going to be just as important for the company as either iOS or Mac OS X—if not more. In a week full of major announcements, iCloud was unquestionably the most important of the three, and it’s certainly the one with the farthest-reaching implications for Apple’s strategy and the users of its products. Both before and after the keynote, comparisons of iCloud to Apple’s flawed MobileMe online service seemed to crop up with a frequency usually reserved for political scandals. But while it may be tempting to draw a straight line from Apple’s previous online venture to its new one, the two are markedly different. MobileMe (like iTools and .Mac before it) was always an afterthought, an ancillary product that was more a concession by Apple to the necessity of an online presence than an acknowledgement of just how fundamentally the Internet has changed our interactions with technology. But that latter understanding has clearly informed Apple’s development of iCloud. While the service does build on parts of MobileMe, it takes just those parts that enhance the device experience: specifically, the idea of ubiquitous data without user intervention. Apple has been just as quick to trim the fat, too, though. All indications point to iDisk, iWeb hosting, and MobileMe Galleries going the way of the garefowl. It seems as though Apple has ceded its ground in those areas—a smart move, since those facets of the service were born of an era where being online meant producing your own content and hosting it somewhere. At the time, competitors like Yahoo and Google were threatening to dominate the space, so it wasn’t surprising that Apple might have felt like it had to plant a flag or risk being shut out. So the company planted that flag—and then left it more or less flapping in the wind. That shouldn’t be a surprise, though: Apple was never really interested in being a Web content host; it just didn’t want to be the only one standing when the music stopped. With iCloud, the company has instead rightly chosen to focus—and expand—on the aspects of connectivity that mesh with the company’s philosophical and business goals: promoting and selling its devices. To anyone who’s been following Apple for a long time, there’s always been a tacit assumption that the Mac—due to its longevity, if not the company’s “digital hub” strategy—has always been the company’s primary platform, despite the fact that Apple’s mobile devices have outpaced it in terms of sales volume for some time now. Monday’s announcement tacitly confirmed that previous state of affairs (after all, if the Mac wasn’t top banana, it couldn’t really be demoted) but it’s worth noting that it didn’t “lose” that spot to iOS; instead, all those hardware devices are now on the same level playing field—and they all look to the same third source: iCloud. iCloud the next step in an effort to remove the idea of the filesystem from the computing experience—an effort that began as far back as applications like iTunes and iPhoto. Apple’s introduction of the iPad made great strides in this department, but there were still problems: Sooner or later, most iPad users had to interact with the filesystem of a traditional computer. How, then, did you move files to a device that had no exposed filesystem? Apple’s answer was the clunky, bolted-on iTunes File Sharing—in hindsight, clearly little more than a stop-gap solution. Meanwhile, third parties came up with their own schemes, ranging from relying on syncing services like Dropbox to built-in file servers that let you mount part of the iPad’s storage space as a volume on your Mac. File management on the iPad (and the iPhone) has been, to date, a fragmented experience: It’s got too many ways to move files around, and none of them are very good. It’s one of the few things that makes the iPad feel like it’s not quite a full citizen in the technology world. It’s an uphill climb, though. In the same way that the iPad has set out to change the idea of computing, iCloud aims to eliminate the basic idea of files. After all, you don’t really have files—you have stuff: pictures, videos, songs, books, documents, presentations, spreadsheets, and so on. The idea of “the file” is a conceit that we’ve been stuck with for decades, but in many ways it’s no more relevant to us these days than segmenting your data over a handful of floppy disks or worrying about which stack of punchcards your program is encoded on. Sure, files are the way computers understand data—but they’re not necessarily the way users should understand their data. For example, consider a folder of photos and a folder of songs. The Finder largely treats them the same way: There’s a bunch of items you can select, move, cut, paste, delete, rename, and so on. But while the computer treats those files as essentially the same type of object, they’re not the same from a user’s perspective. What do you want to do with a song? Play it, pause it, put it in a playlist, scrub through it, rate it, and so on. What do you want to do with a photo? View it, crop it, rotate it, tweak the colors, put it in an album, identify the people in it, et cetera. These obviously aren’t the same kind of data, and they shouldn’t be treated as such. Viewing pictures as a collection of thumbnails is pretty handy—for songs, not so much. Not all files are created equal: Viewing pictures as thumbnails may make sense, but songs? But once you leave the Finder behind for a program like iPhoto or iTunes, you’re not dealing with the files but with the stuff itself. Not only do those applications provide us with the right contextual tools to deal with the specific type of content, but they also take care of managing those files on the disk. They eliminate the overhead of having to think about where you’re saving a file, or whether you need to make a backup before editing it. All those tasks can be handled by the system, without a conscious effort on the user’s part. And really, why should the user have to deal with it? The idea that we should view our data as files is no less arbitrary than viewing them as a collection of ones and zeroes. It’s technically correct—it’s just not really useful for your average human. More than anything, though, it’s just the way it’s always been done. Looking back, the iPad now seems in some ways like a sort of test balloon for iCloud. Apple’s tablet was all about taking the concepts of computing that we’ve adhered to for 25 years, rethinking what they aimed to accomplish, and trying to figure out whether there was a better way. But we still ended up dealing with, thinking about, and worrying over files, thanks to anachronistic features like iTunes File Sharing. iCloud takes that vision of a file-less future to the next step: No more worrying about where to save things, or where you put that file. By having apps take care of the nitty-gritty details of file management, we’re moving from the document-centric interface of the last 20 years or so to an application-centric model. It’s about actions instead of objects, verbs instead of nouns. It’s not a system without flaws, of course, and we won’t even know many of those until we’ve actually spent some quality time with iCloud. But, if you view this as the latest data point on a chain stretching from iTunes to the iPad, Apple’s future trajectory is clear: the idea of arbitrary “files” are destined for the same fate as the command line. Not complete and utter annihilation, but a gentle retirement where they’re only occasionally called upon to perform their former duties. This overarching strategic move is what makes iCloud different from similar ventures. Superficially, iCloud certainly looks a lot like cloud storage efforts we’ve seen from companies like Google and Microsoft. In fact, I can guarantee you that when I get back home and talk to people about iCloud, at least one of my friends will say something like: “Storing files on the Internet? What’s the big deal? We’ve been doing that for years.” But, like an Iron Chef competition, while the ingredients are the same, Apple’s conjured up a decidedly different dish as the end result. Apple has tried this with a variety of other technologies in the past, including backups, video chat, music-making, and more. Those attempts have had varying degrees of success, but in almost every instance, they’ve at least raised the bar for both Apple and its competitors in terms of what comes next. While iCloud might be distinct from the cloud services offered by Microsoft, Google, and Amazon, there seems to be very little question that it will push all of those efforts forward by demanding that users not be bothered with trivial ideas like files any more. So stop thinking about iCloud as though it’s merely another cloud storage service or simply a replacement for MobileMe. See it instead for what it’s intended to be: an underlying part of Apple’s ecosystem. And if it delivers on the company’s promises, it could stand to be just as integral to Apple’s future as its other key service—one that you probably use every day, oftentimes without even thinking about it: the iTunes Store.